I love chalk. There are so many amazing ways you can use it for learning, and the bonus is you get to do it outside! 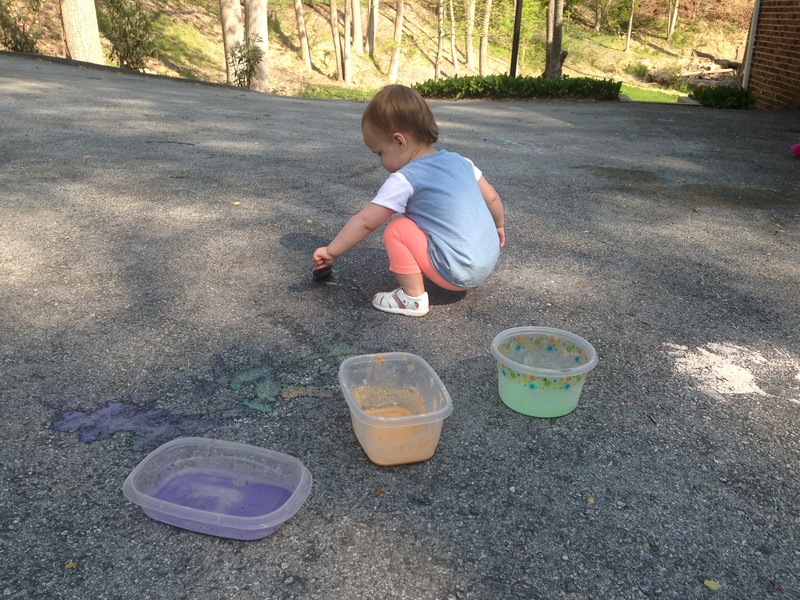 However, I have to wonder- am I the only person who is constantly running over pieces of chalk in the driveway? As nice as my tires look in a beautiful shade of pastel, I get really tired of wasting chalk, so we used the smushed up mess to create chalk paint. I know they sell chalk paint, but that $10 box would last us a day. I’ll take my 50 cent box of chalk and a little elbow grease. We made our chalk (couldn’t be easier) and put it in some old tupperware containers. We got out some paint brushes and went to town. Let your kids get crazy because the beauty of chalk paint is that it washes right out! You will need to have your chalk ground up as finely as possible. I found that a cheese grater worked best to get it nice and powdery. Add water slowly and mix the chalk until it has a thick soupy consistency. That’s it- could it be easier!? I found that larger paint brushes engaged Layla more in this activity, so the bigger the better! Next time we do this activity I’m going to try using a paint roller- updates to come!